“The project is on hold due to the economy,” said Patrick Sheedy, Krog Corp’s vice president. 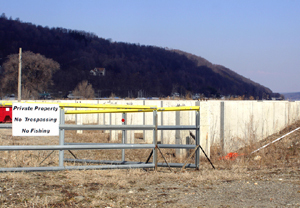 Hammondsport Mayor Emery Cummings said that was what he had heard as well. He said the current state of the economy had slowed the project down. The building project on Keuka Lake in Hammondsport has been stalled in the past, due to construction changes. It was even at one point supposed to be completed by the spring and later the fall of 2009. At the end of January, 2009, the condominiums were expected to be ready for occupancy by spring of 2009. Work was forced to slow down when changes to the roofing required them to take new bids for the steel. The framing changed to incorporate wood trusses.